Especially, we need winter clothes for mountain life for them. And we bring pencil ,note etc.. stationary for kids to buy in event profit. please,come and enjoy with us! What can we do to protect the environment of our planet in our daily life? It is time to think of the link between our everyday-life activities and the natural environment. Finding ways to live ecologically can o er this beautiful planet to our children. Through this event, we hope more people consider the idea of the eco life and share the ecological experience. This event is non-pro t event.We will donate this event pro t to "Maeyanoi School in Jomthong"
This used free market is only exchange without money. Please bring clothes to replace it is no longer needed. 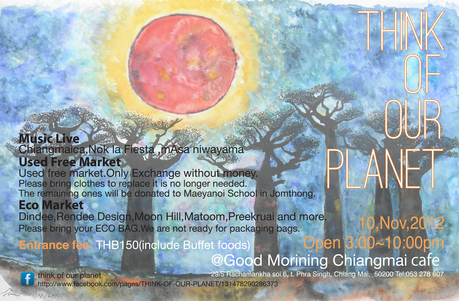 Nice food will be reserved from Good morning cafe.It’s use organica vegtable.